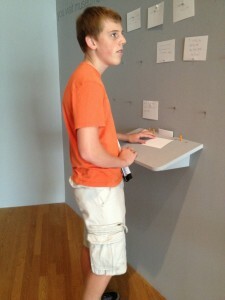 We visited the Nasher Museum of Art, a participating member in the Museums On Us program by Bank of America, last month. The Museums On Us program offers free admission to card holders the first weekend of each month to dozens of museums across the United States. Since the Nasher Museum is “in our back yard,” we couldn’t resist a visit! The Nasher Museum, located on the Duke University campus, offers a permanent collection entitled, “Containing Antiquity” that highlights storage vessels used by Greek culture throughout the Mediterranean. Our daughter enjoyed the tiny vessels on display while our son liked everything big and bold. So like girls and boys! The Nasher Museum of Art also offers a variety of rotating displays. We enjoyed the “Olafur Eliasson: The Uncertain Museum” exhibit most of all. This installation by the Danish artist allows visitors to become part of the art — interacting with patterns, light and shadow. Our son enjoyed directing us into a variety of poses and taking photos with the provided camera. Our daughter, ever the ballerina, enjoyed posing! We laughed and played and even returned to the exhibit a second time before leaving the museum. Because collections rotate regularly, the Nasher Museum has something fresh to offer every couple of months. We will certainly return in the future to see the Matisse and Modern Masters Exhibit (November 2012-February 2013) and the Photographic Works of North Carolina (February-May 2013). In addition to participating in the Museums On Us program that offers free admission to cardholders (one admission per card presented, not family admission), the Nasher Museum of Art offers Family Days. Museum admission is free on Family Days and the museum offers special crafts, performances and gallery hunts to engage families in art. Because exhibits constantly rotate through the Nasher Museum of Art’s three pavilions, every family day offers a unique experience. For the budgeting family, a free day at the museum is hard to beat! It offers something fun to do on a zero budget AND builds art appreciation! Double win! Do you visit art museums located near you? Why or why not? Thanks for these posts, Karen. 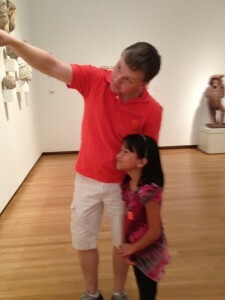 We have never been to the Nasher, but we will in Nov. on the next Family Day! We went to the Columbus Museum of Art the last time we were in OH and that was a great family day and great education for our young artist! I can relate to living close to something and taking it for granted. We lived in south Fl for 18 yrs. and I never went to Key West or did a tour of the Everglades. Now that I don’t live there, I wonder what I was thinking!! It’s nice that the museum you discussed rotates their inventory regularly. That makes it a fun place to return to time and again! Ohhhh, Key West. I’d love to go, for a couple days. 🙂 The great state of Florida offers so much, it would be hard to do it all, even if you live there! Good for you! It’s funny how we tend to forget to visit and enjoy places that are in our own backyard. We live very close to the McMichael Art Gallery (like crazy close) and I had never been until 2 years ago on a school trip with my son! So, no. We don’t go often enough. When we visited Paris this spring, I wondered whether the locals are immune to their incredible culture like we are here. Can you imagine living crazy close to the Louvre and never going?